In this lesson video we're gonna talk about something called the No-Shift. So essentially, we've been dealing with, No-Shift questions from the beginning, and they're not as complicated as the Shift questions, but it is important to note that, hey, there is something called a No-Shift and sometimes there are certain words such as likewise, just as, dot, dot, dot, so, which we'll talk about here at the end of this video. And then not only, but also construction that shows us that we're dealing with a sentence that does not shift. So to give you an example, of the difference between a not shift and a shift sentence, let's just take some, some very basic sentence here starting with, in public, she was blank and at home she also kept to herself. So, what's important here is the and. There is no contrast. So, in public she's the same way she's at home. She keeps to herself. She's someone who is reserved, not outgoing or brash which is, speaking your mind in an obnoxious way. Tired doesn't quite fit the context. But of course the point here, is to contrast this, no shift sentence here, with one that is a shift. And we see the shift here with the word yet. So now we have a contrast between life of the party, and what's the opposite of that. Well at home, she's the opposite of life of the party, she is reserved. So again, the difference between these two sentences is basically very obvious, it should be, the whole idea of and versus yet, or and versus but. Things get a little complicated, when you move away from just simple words like this. 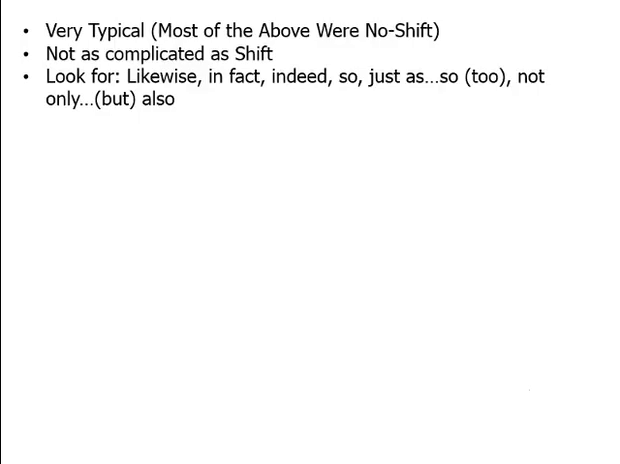 So, of course again, the second one is a Shift, the first one is a No-Shift. What's a No-Shift look like when it's more complicated? Well boom, there it is. Just as the cultural context of a novel can inform interpretations, so to, so to. So you'll notice this is a construction that, we saw there a, a second ago, at the very first slide as such just as dot dot dot so to. And, the dot dot dot means that there are words that are coming in between the just as and the so to. And there, in this case was quite a few words. But the point is that this sentence isn't shifting. It's not saying, oh, cultural context of a novel can inform interpretations, but it's not always helpful. That would be a Shift here, just say, cultural context of a novel is helpful for interpretations, and it can also, it's important here with the historical backdrops. So it can inform interpretations and be helpful or inform historical backdrop. That's the, relationship we, should note here. So, again, this is just as, so to construction, No-Shift sentence. You wanna follow your basic strategies. Notice, what word should go in the blank here should be similar to as inform, because we pick up on this phrase, and therefore, the word that works very nicely here is familiarity, not ignorance because that would show that suddenly culture context and novel isn't important, that there's been a shift. Words like confusion or answer choice C also don't make sense, nor do apathy, which means you don't care at all. It's important to note that yes, historical backdrop is important, just as cultural context of a novel is. And finally we can get rid of D, indulgence, and to be indulgent in something is to treat something kind of excessively fondly, especially without, doesn't, that thing doesn't really deserve that, which doesn't make sense whatsoever in this context.